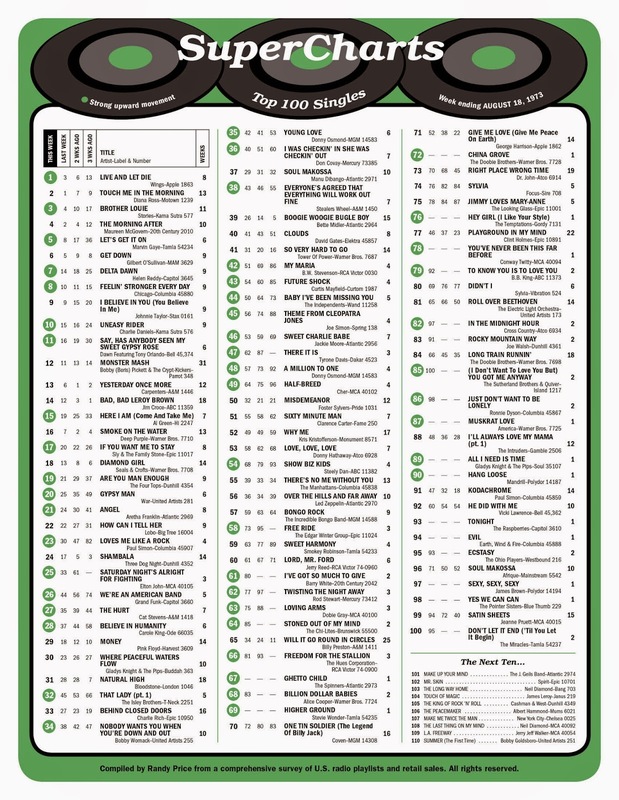 A few years ago we compiled a chart designating The Top 200 Biggest #1 Hits of "The Beatles Years", 1964 - 1970. We've compiled a list of The Top 200 Biggest Number One Records of the Beatles Era. Many, many years ago Casey Kasem did a special American Top 40 Countdown saluting The Beatles Era and it was one of my favorite "special countdown" shows. I decided to take it another step further ... and expand the list to 200 songs ... but only included the records that actually made it all the way to #1! The list includes ONLY #1 Records ... so records that may have charted longer or earned more points in a conventional countdown will not appear here unless they reached #1 in one of the major trade publications. Next up would have to be "Cecilia", also #1 everywhere but Billboard (including Chicago). Billboard apparently denied it a #1 berth by giving a second week at #1 to Ray Stevens' "Everything Is Beautiful" instead. Two more such occurrences happened in August when Stevie Wonder's "Signed, Sealed, Delivered, I'm Yours" and Eric Burdon and War's "Spill The Wine" both reached #1 in both Cash Box and Record World but not in Billboard. In hindsight, I'd have to say "Spill The Wine" was the more deserving of the two, despite the fact that I have NEVER liked this song. It just played like a #1 Record. Creedence Clearwater Revival never had a #1 Record in Billboard Magazine. For years they were called The Kings of #2. This was not the case in Cash Box and Record World, however, where "Proud Mary" and "Bad Moon Rising" both hit #1 in Record World in 1969. It happened again in 1970 when "Lookin' Out My Back Door" reached the top in both Record World and Cash Box ... but not in Billboard. All three CCR hits were deserving of this honor. Billboard denied "Proud Mary" #1 status by charting "Everyday People" by Sly and the Family Stone" and "Dizzy" by Tommy Roe at #1 for four weeks each instead. "Bad Moon Rising" was eclipsed by a five week run at the top by The Beatles' "Get Back", in hindsight one of their weaker efforts that STILL managed to hold down the #1 spot for five big weeks in both Billboard and Cash Box. And finally, "We've Only Just Begun" by The Carpenters, their follow-up hit to their #1 smash "Close To You", reached the #1 spot everywhere but Billboard. Big as it was at the time ... and big as THEY were at the time, this one definitely should have earned across-the-boards #1 status. "Lonely Days" was a HUGE comeback record for The Bee Gees ... and it reached #1 in both Cash Box and Record World ... but NOT in Billboard ... a HUGE mistake in my opinion. This record marked a HUGE comeback for The Brothers Gibb and topped the charts all over the country and was deserving of a #1 berth. A major oversight seems to be John Denver's "Take Me Home, Country Roads", #1 for two weeks in Record World and one week in Cash Box ... but never reaching the summit in Billboard. While I'm not a big John Denver fan, I believe that this record was deserving of a #1 showing ... and it opened up a huge career for him. Right behind it came "Spanish Harlem" by Aretha Franklin, #1 for a week in both Cash Box and Record World. I'm not so sure about this one either. Billboard had Donny Osmond's "Go Away Little Girl" at #1, the start of a three week run at the top of their pop singles chart. Record World had Badfinger's "Day After Day" at #1 for two weeks in February of 1972. While it's a great record (and one of my all-time faves), it failed to hit the top spot in both Billboard and Cash Box and, as such, I'd have to say probably was NOT deserving of #1 status. A month later, however, Sonny Geraci and Climax hit #1 everywhere except Billboard ... and that record, big as it was at the time, absolutely deserved its #1 achievement. The Moody Blues were also denied a top spot in Billboard for "Nights In White Satin", a record that topped Cash Box for a week and Record World for Two. Other 1972 records that made it to #1's in two of the three national trade publications (but not Billboard) include "I'll Be Around" by The Spinners and "I'd Love You To Want Me" by Lobo. There were also a couple of Cash Box only #1's worth mentioning that perhaps deserve attention as worthy #1's ... "Got To Be There" by Michael Jackson, "Rockin' Robin" by Michael Jackson, "Sylvia's Mother" by Dr. Hook and the Medicine Show, "Nice To Be With You" by Gallery, Back Stabbers" by The O'Jays and Burnin' Love by Elvis Presley. Of these choices, I'd have to go with the last two as most-deserving of being a #1 Record. There were several songs that topped both the Cash Box and Record World charts in 1973 but failed to reach that position in Billboard ... probably the most we've seen thus far in our little expose of what constitutes a #1 Record. "Americans", the spoken word record by Byron MacGregor topped both the Cash Box and Record World charts for a week in February ... but failed to do so in Billboard. Somehow, I just don't feel that this was a deserving #1 Record, although it did garner quite a bit of media coverage at the time of its release. 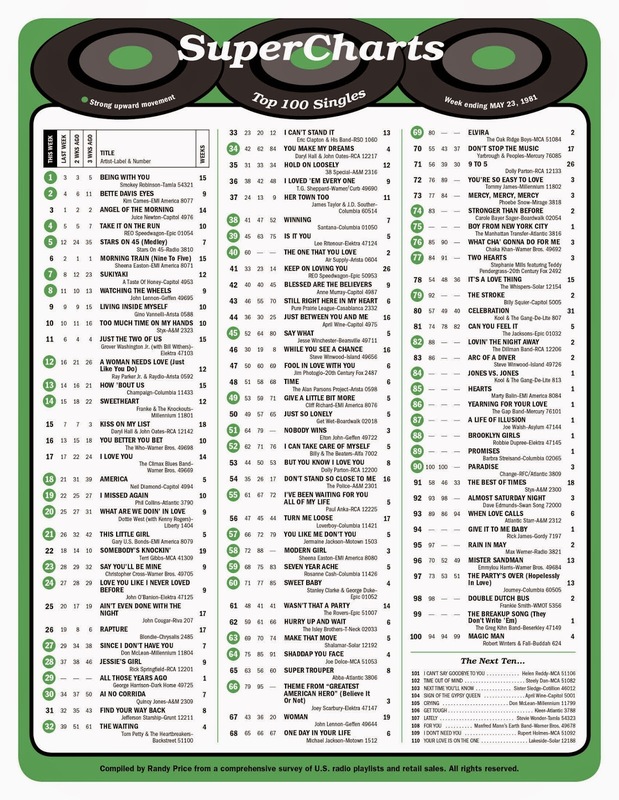 "Boogie Down" by Eddie Kendricks also topped the chart in Cash Box and Record World, as did "Dancing Machine" by The Jackson Five, "The Show Must Go On" by Three Dog Night, "You Make Me Feel Brand New" by The Stylistics, "Don't Let The Sun Go Down On Me" by Elton John, "Jazzman" by Carole King and "When Will I See You Again" by The Three Degrees. Much as I liked these records, I don't know that "The Show Must Go On" or "Jazzman" deserved #1 status. "Dancing Machine", "Don't Let The Sun Go Down On Me" and "When Will I See You Again" probably did. 1975 saw "Boogie On Reggae Woman" by Stevie Wonder, "Jackie Blue" by The Ozark Mountain Daredevils, "Someone Saved My Life Tonight" by Elton John and "Mr. 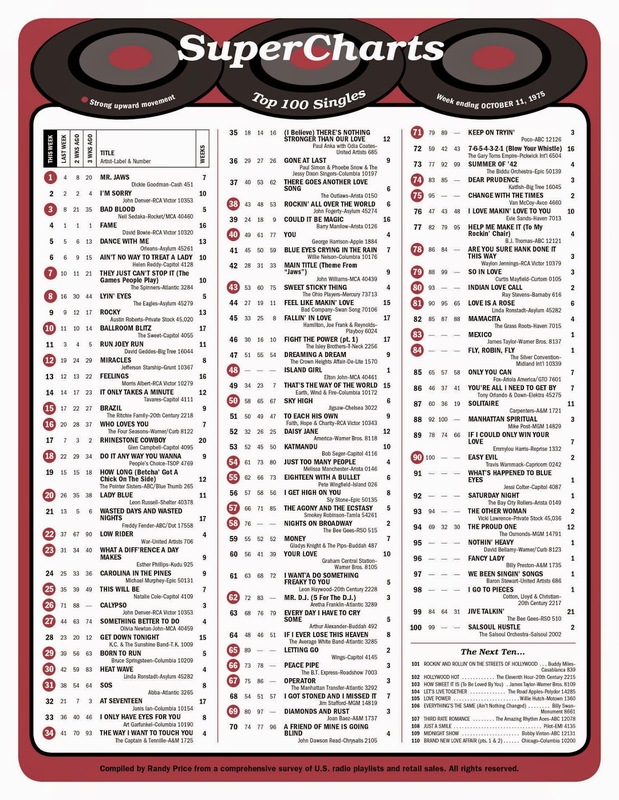 Jaws" by Dickie Goodman top both the Cash Box and Record World charts but fail to do so in Billboard, perhaps the shortest list we've run into so far. Elton John was hot as can be in 1974 and 1975, so "Someone Saved My Life Tonight" probably deserved #1 status. So did "Jackie Blue", which we still hear nearly every single day some forty years later. "Mr. Jaws" was HUGELY popular at the time ... but #1? I don't think so. (It peaked at #4 in Billboard ... so it wasn't even close). However, Randy Price's Super Charts also shows it at #1 when factoring in the combined rankings of the three major trades ... so maybe it did! In 1977, not a single record hit #1 in both of the other publications without hitting #1 in Billboard ... first time we've seen THAT!!! Billboard #1's that failed to peak that high in Cash Box and Record World include "New Kid In Town" by The Eagles, "Don't Leave Me This Way" by Thelma Houston and "Looks Like We Made It" by Barry Manilow. If there's a #1 Record that probably deserved an across-the-boards ranking at the top of the charts (but didn't get it), I would have to go with "Don't Stop" by Fleetwood Mac. 1978 started with Player's hit "Baby Come Back" at #1 in both Billboard and Cash Box ... but NOT in Record World. ("How Deep Is Your Love" by The Bee Gees, a carry-over #1 hit from 1977, experienced the same fate. I can't imagine for a moment "How Deep Is Your Love" NOT being a #1 Record!) That's because Record World charted Debby Boone's "You Light Up My Life" at #1 for THIRTEEN WEEKS ... replaced by "We Are The Champions" by Queen, a record that failed to hit the top in Billboard or Cash Box. (I would have to say that ALL of the above mentioned tunes absolutely deserved a #1 ranking). "Emotion" by Samantha Sang and "Baker Street", both hit #1 in Cash Box only (and were deserving of #1 status in the eyes of all of America) ... while Anne Murray's "You Needed Me", #1 in Billboard and nowhere else, was probably NOT worthy of that honor. 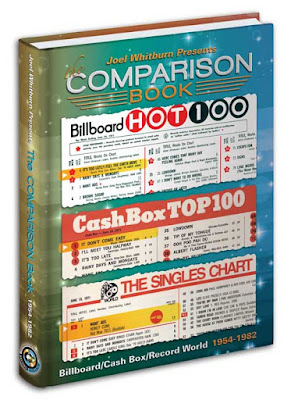 Only one record again this year that hit the top spot in both Cash Box and Record World despite failing to do so in Billboard Magazine ... and that distinction belongs to "Sail On" by The Commodores. #1 in Billboard only: "Love You Inside Out" by The Bee Gees (worthy) and "Pop Muzik" by M (not). "Please Don't Go" kicked off the new decade at #1 in Billboard only ... I don't think it deserved it, especially in light of the competition ("Escape" by Rupert Holmes and "Rock With You" by Michael Jackson). Kenny Rogers' hit "Coward Of The County" was #1 in both Cash Box and Record World, but failed to climb that high in Billboard. I don't think it was deserving of Pop #1 Status. However, somehow Paul McCartney's live version of "Coming Up" only hit the top spot in Billboard ... and stayed there for three weeks. How this one escaped the #1 position in Cash Box and Record World is beyond me. In fact, Joel will be giving away a copy of this book to a lucky Forgotten Hits Reader at random next week. Wanna chance to win a free copy? NOTE: Forgotten Hits subscribers received a special FRIDAY FLASH edition via email this morning. Just drop us an email at forgottenhits@aol.com, put "Subscribe" in the subject line, and we'll add you to the list. And, if you live in the greater Chicagoland area, let us know that, too, and we'll add you to our Local List, offering special news and offers on concerts happening in our area. A special encore presentation of The Top 200 #1 Hits of The Beatles Era, 1964 - 1970. Don't miss it!